Animated chatter spills out from a corner of tech giant Google's Nairobi offices as five Kenyan schoolgirls discuss their upcoming trip to California where they hope to win $15,000 for I-cut, an app to end Female Genital Mutilation (FGM). The five teenagers, aged 15 to 17, are the only Africans selected to take part in this year's international Technovation competition, where girls develop mobile apps to end problems in their communities. "FGM is a big problem affecting girls worldwide and it is a problem we want to solve," Stacy Owino told the Thomson Reuters Foundation, while snacking on chocolate on a break from boarding school before flying to the United States on Aug. 6. "This whole experience will change our lives. Whether we win or not, our perspective of the world and the possibilities it has will change for the better." The five girls from Kenya's western city of Kisumu call themselves the 'Restorers' because they want to "restore hope to hopeless girls", said Synthia Otieno, one of the team. 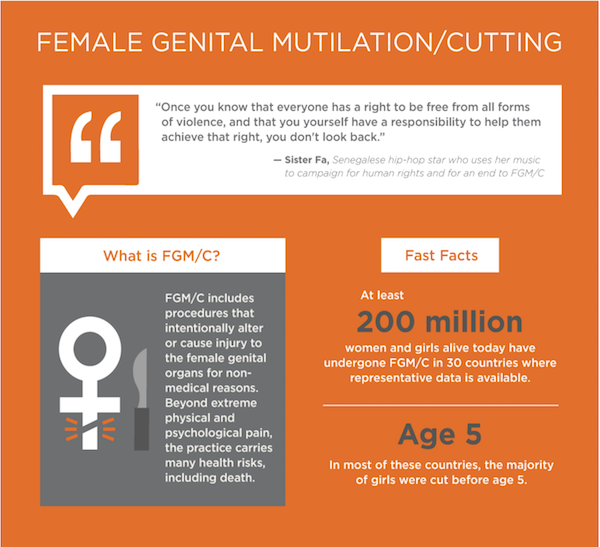 Although the girls' Luo community does not practice FGM, they have friends who have been cut. "We were very close but after she was cut she never came back to school," said Purity Achieng, describing a classmate who underwent FGM. "She was among the smartest girls I knew." Its simple interface has five buttons - help, rescue, report, information on FGM, donate and feedback – offering users different services. "We just have to use this opportunity as a stepping stone to the next level," said schoolgirl Ivy Akinyi who plans to become computer programmer.